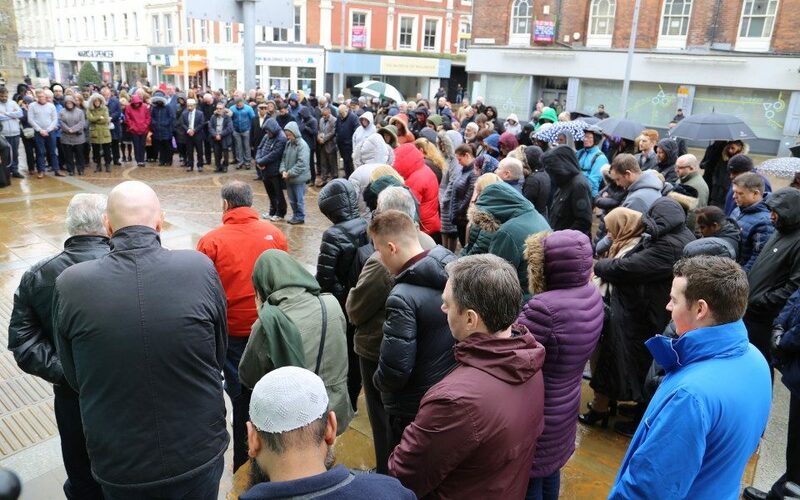 A one minute silence for victims of the terror attack in Christchurch, New Zealand brought the local community together outside Blackburn Town Hall at 12 noon today (18 March). Hundreds of people gathered to pay respects to the victims of the mosque shootings last Friday, and to show solidarity with the people of New Zealand. The short ceremony was opened by Harry Catherall, Chief Executive of Blackburn with Darwen Borough Council. Speakers at the event were Leader of Blackburn with Darwen Borough Council Councillor Mohammed Khan, Abdul Hamid Quereshi, Chief Officer of Lancashire Council of Mosques, Rev Canon Brian McConkey from Blackburn Cathedral, and the Secretary of the Interfaith Forum Derek Estill. The Mayor Councillor Pat McFall was also in attendance. It was important to give our local community the opportunity to come together in a show of unity with the people of New Zealand. Together we sent a message to the perpetrators of these sickening acts that we condemn their actions. They will not divide us and hate will not win. People of all faiths and none find these terror attacks abhorrent and we stand together to say that the acts of terrorism do not belong to any faiths. We commit ourselves to working together for peace and reconciliation between communities and individuals reflecting the love of God as we each experience it from our own faith perspective. We stand together with Muslims in Lancashire and across the world in the treasured belief that, whatever faith, people should be able to live and worship without fear and threat of harm. No matter how many times these random acts of killing occur across our world we will remain steadfast in the face of evil. There is no place in civilised society for such acts of hatred targeting Faith communities. All must be able to exist in safety and to practise their faith freely and without fear. Our thoughts, prayers and sympathy go out to all those who have lost loved ones or who have been affected in any way by this horrendous and senseless act of barbarity against Muslims during an act of worship.